Work on Debian for mobile devices, i.e. telephones, tablets, and handheld computers, continues. 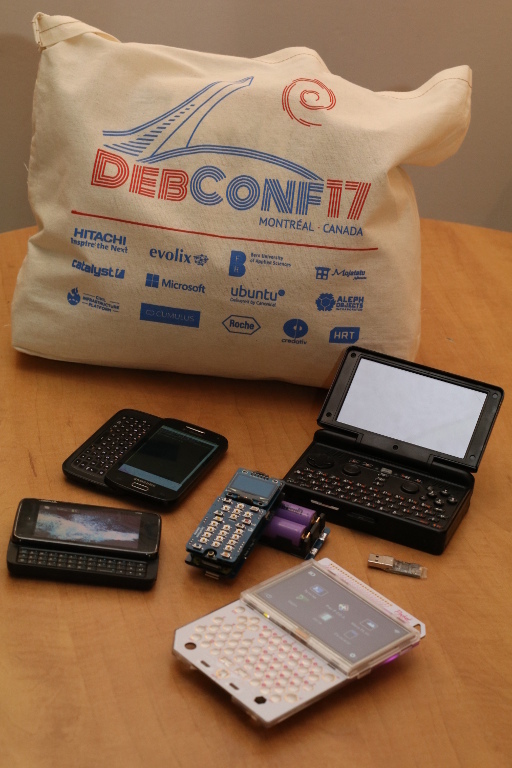 During the recent DebConf17 in Montréal, Canada, more than 50 people had a meeting to reconsider opportunities and challenges for Debian on mobile devices. PocketCHIP: A very small handheld computer with keyboard, Wi-Fi, USB, and Bluetooth, running Debian 8 (Jessie) or 9 (Stretch). Pyra: A modular handheld computer with a touchscreen, gaming controls, Wi-Fi, keyboard, multiple USB ports and SD card slots, and an optional modem for either Europe or the USA. It will come preinstalled with Debian. Samsung Galaxy S Relay 4G: An Android smartphone featuring a physical keyboard, which can already run portions of Debian userspace on the Android kernel. Kernel upstreaming is on the way. ZeroPhone: An open-source smartphone based on Raspberry Pi Zero, with a small screen, classic telephone keypad and hardware switches for telephony, Wi-Fi, and the microphone. It is running Debian-based Raspbian OS. The photo (click to enlarge) shows all four devices, together with a Nokia N900, which was the first Linux-based smartphone by Nokia, running Debian-based Maemo and a completely unrelated Gnuk cryptographic token, which just sneaked into the setting. or join the #debian-mobile IRC chatroom at irc.oftc.net.